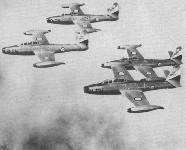 Four P-84Bs of the 49th Fighter Bomber Wing, USAF. 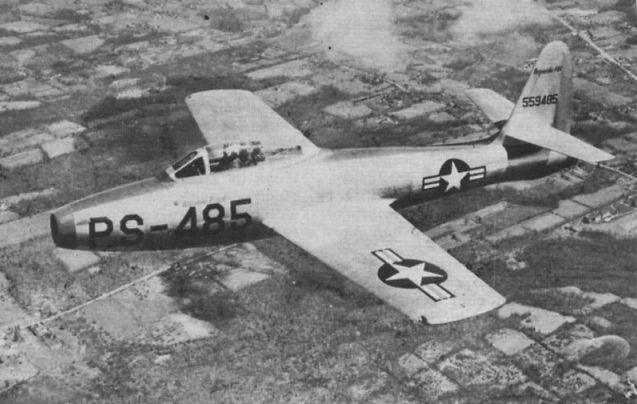 The first prototype XP-84, 559475 in natural metal finish, showing the detachable rear fuselage for engine access. Another of the 15 pre-production machines, 559485, over Farming dale, New York State, in 1947. The pre-production YP-84A the controls. 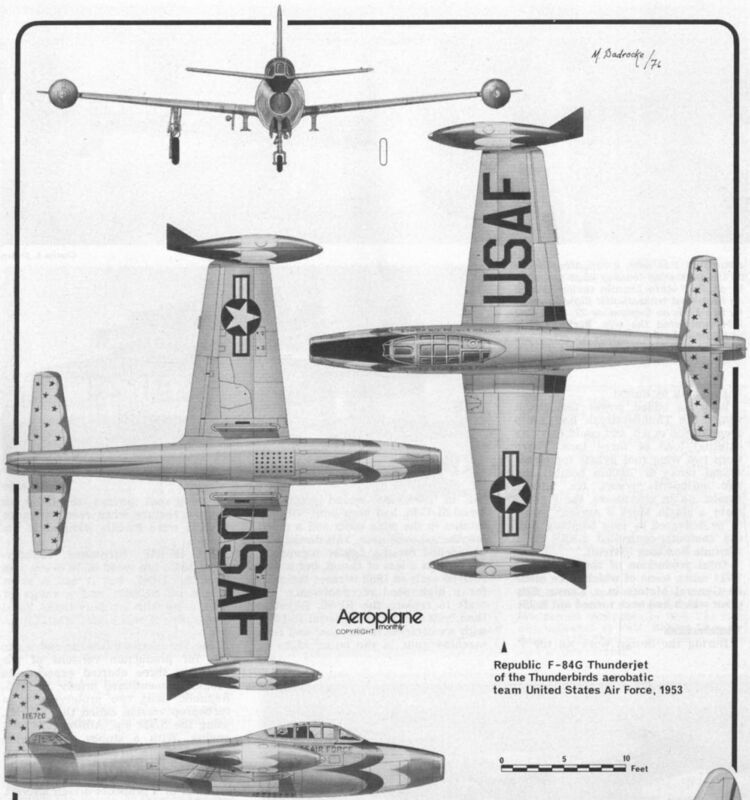 The 15 pre-production aircraft were 45-59488 with Republic test pilot Jack Bade at eventually modified to F-84B standard. Capt Johnson makes an assisted takeoff in F-84E 92423 during the Bendix Air Races at Edwards AFB on August 18, 1951. 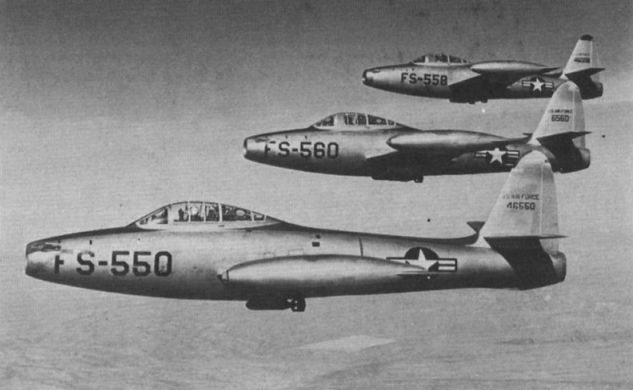 A formation of F-84Bs up from Lake AFB, Arizona, on February 1, 1952, complete with practice bombs. 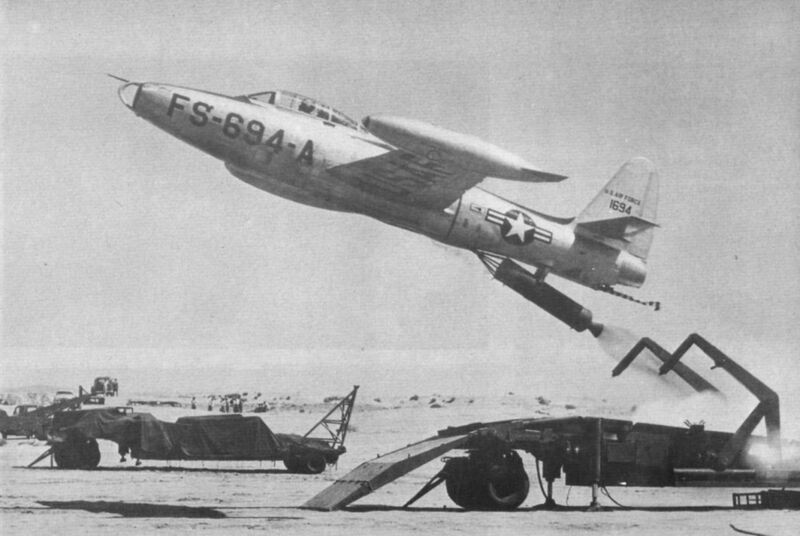 F-84F 1694 blasts off from a trailer with the aid of a RATOG booster during trials at Edwards AFB, California, in 1955. Note the intake guard and arrester hook. 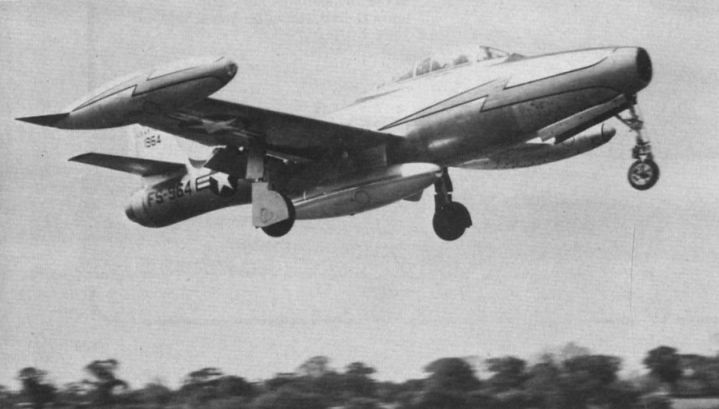 F-84G 1964 of the 20th Fighter Bomber Wing, 49th Air Division, takes off from Wethersfield AFB, England, shortly after the Wing had moved there in June 1952. 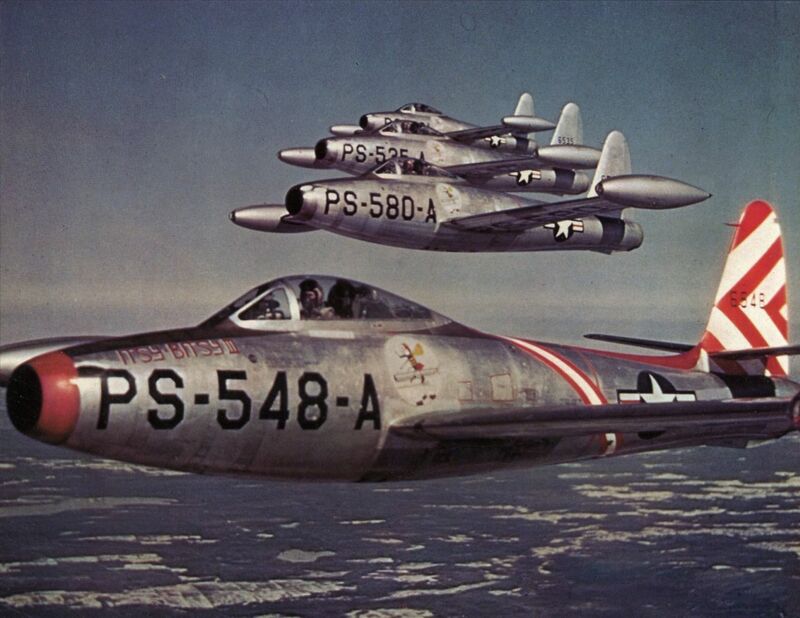 An F-84 with a refuelling probe in the port wing leading edge noses up to an RAF Avro Lincoln tanker during an East-West transatlantic flight attempt by two F-84s on September 22, 1950. One F-84 completed the trip. F-64Gs of Koninklyke Luchtmacht No 314, Royal Netherlands Air Force, in June 1955. 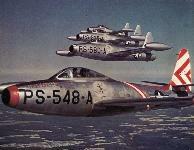 F-84Gs were the fastest aircraft in Royal Norwegian Air Force service when this picture was taken in 1955. The type was delivered in 1951. Несколько экспериментальных вариантов F-84 различного назначения в серийное производство не передавалось. На XF-84H (на фото) установили мощный ТВД XT40-A-1 со сверхзвуковым трехлопастным винтом. Первый из двух XF-84H поднялся в воздух в июле 1955 года. 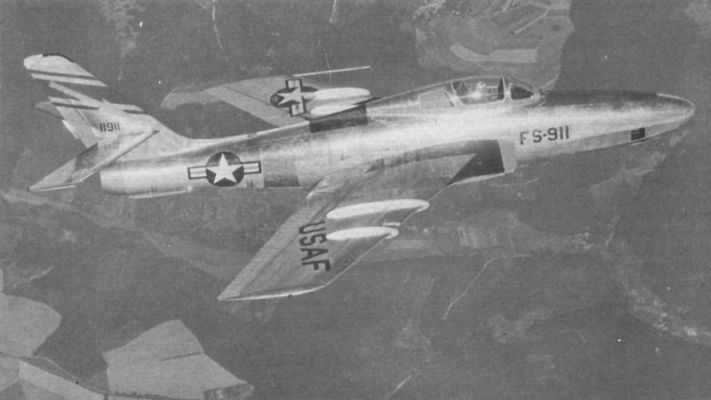 The weird XF-84H experimental turbo-prop fighter, photographed on July 21, 1955. Thunderflash 11911 displays the camera-laden nose of this variant.